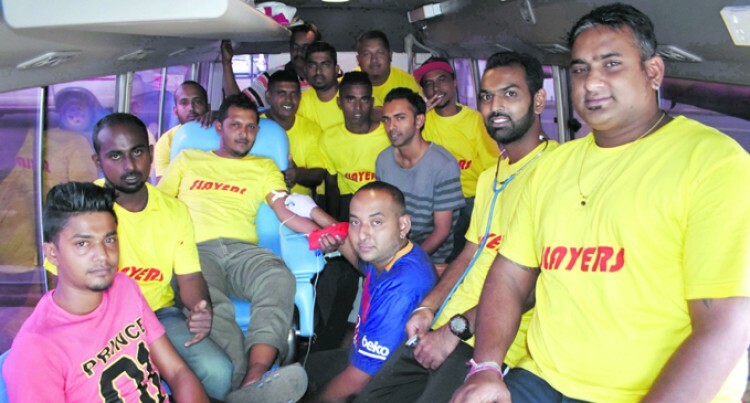 Members of the newly formed Slayers Club, with service to the less fortu­nate as their main objective, donat­ed blood to Labasa Hospital during the blood drive in the Northern Di­vision town yesterday. The 20-member club made up of taxi drivers, civil servants, busi­ness operators and unemployed youths aims to help the poor of the poorest and needy people in the di­vision. Club president Ravinesh Raj said the idea to form a club was realised during a fundraising drive where they were encouraged to contrib­ute or raise funds so they could im­prove a person’s living condition. “So from March every Wednes­days we meet at a friend’s residence to discuss what programmes to do and collect money at the same time,” Mr Raj said. “Hence, we are able to provide gift packs to residents at Labasa Citizens Home during Mothers Day and donated grocery to a family at Nabekavu who lost everything in a house fire. “This donation of blood is our third programme and for the next project we will visit a 65-year-old disabled person who is living alone at Dogotuki in Macuata province to provide some assistance. “Another important project in the pipeline will be to set up a water system for a poor family at Buca Bay. Labasa Hospital Blood Donor Ser­vices Phlebotomist Ashneel Kumar thanked the club members for sac­rificing their weekend to donate blood.